When designing a room one of the first things homeowners think of is paint color. It is helpful to think of paint ideas but don’t start there. We often pick one item, either a rug or a piece of furniture, and build our color palette out from there. First step is to choose your inspiration piece. Take a swatch of fabric or colors from the rug and collect other furniture pieces that compliment your inspiration piece. Once you have all you pieces: furniture, rugs, and window treatment fabrics chosen, fill in the missing color elements with accessories and then finish with paint color. There are so many options for paint colors but limited matches and complements for fabric colors. Variety is the spice of life and the key to creating a successful interior design. No one wants to walk into a space that looks like a showroom from Crate and Barrel or West Elm. When designing a furniture plan, make a list of all the items you need with dimensions that will fit in the space. Now comes the fun part. Search the internet, catalogs, stores, and consider custom pieces for a few options for each piece of furniture you need then lay them out in different combination to see which one looks the most pleasing together. Don’t be afraid to make bold and unusual choices. Just because it wasn’t your original idea, doesn’t mean they aren’t the best combination. Clutter is clutter no matter how decorative it is. Fewer, high-quality pieces are the best way to create a cohesive interior design that is easier to keep tidy. Living with less doesn’t have to have a stark feeling or create the feeling of scarcity. Fill the space with colorful or comfortable piece of furniture, pillows, and rugs for a cozy feel without having to clean around accessories and knickknacks all the time. Lighting is a key element to an interior. Allow as much natural light in a space that is comfortable by designing window treatments that enhance the room but don’t block the light. Utilize mirrors to reflect natural and artificial light in the space. Use a combination of table, wall, and overhead lighting for a comfortable, layered lighting design. Lighting the walls is often the best solution. Add dimmers to all overhead and ceiling lighting. This might be counterintuitive, but from trial and error, a couple of large pieces work much better in a small space. A large sectional will give you more seating than a loveseat and a chair. It will also be much less visually busy. Even with larger spaces, it’s important not to over-furnish a room. Give yourself space for to move freely and open areas in the room and on walls for your eyes to rest. Here at Forrest Glover Design, it is no secret that we love a dark interior. We found some major inspiration in these minimalistic Thanksgiving spreads and we hope you do too. Add a little richness to your holiday by designing around a darker color palette to accomplish a moodier more contemporary look. 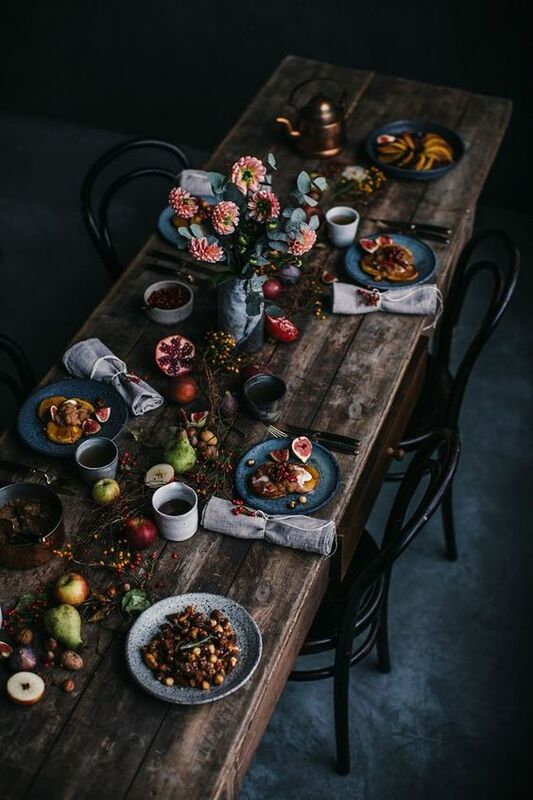 We love this rustic wood table and the way the earthy flowers bring texture and warmth to this beautiful setting. Adding gorgeous glassware and metal silverware to this base, and your are ready to host. 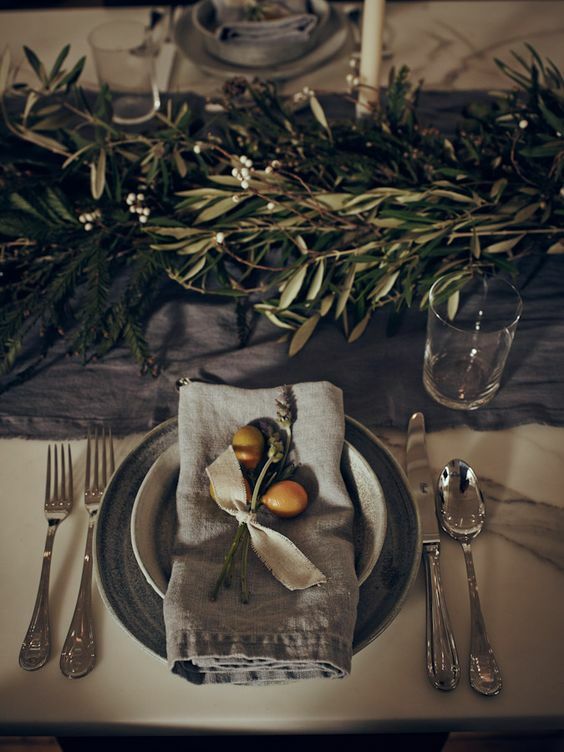 A beautiful, simplistic table setting with gorgeous earthy elements. We love the simplicity and elegance of this design. This setting is a perfect example of impactful minimalism, less can be so much more. Let the flowers do the talking for your setting this year and you will be thankful. 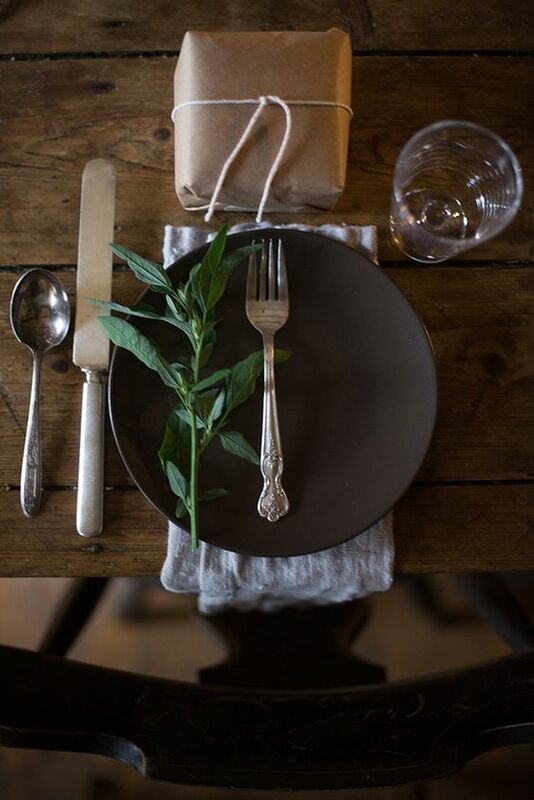 We love this gorgeous center piece paired with candles and copper glassware. Elegant, simple and sophisticated and we are oh-so grateful. Amanda Luu and Ivanka Matsuba are the powerhouse behind the incredible Mondine Studios located in San Francisco, CA. Together, they create timeless flower arrangements for weddings and editorials locally and internationally. Their arrangements are breathtakingly gorgeous, minimalistic, and elegant. Inspiration is found in the lushness of English Garden arrangements and the precision of Japanese ikebana. 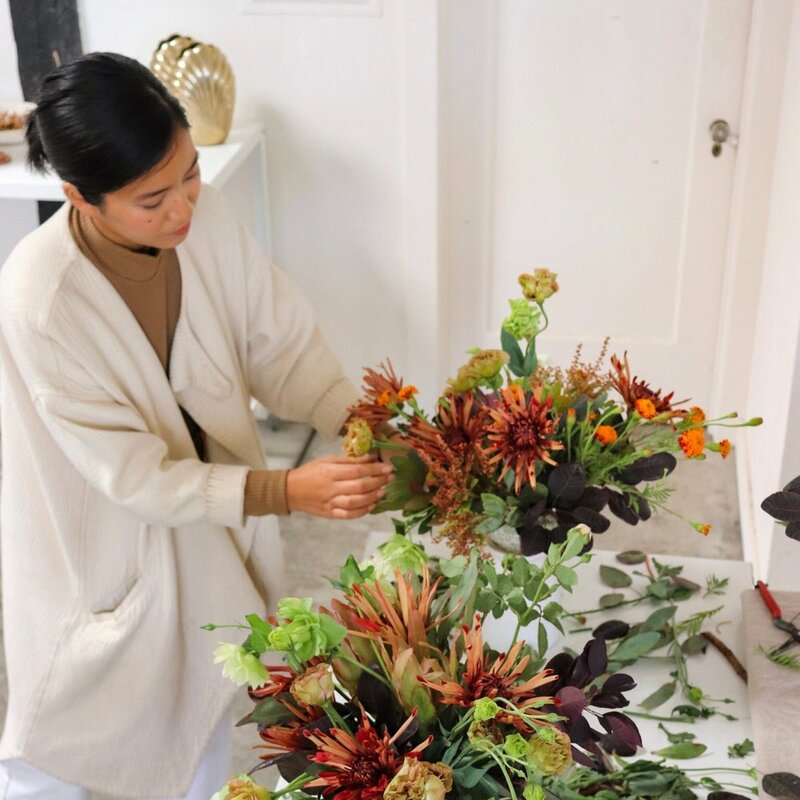 The floral designers stay versatile by adapting their designs to the changing seasons as they continue to challenge themselves creatively by seeking out the rarest ingredients and working with the finest flowers throughout the country. 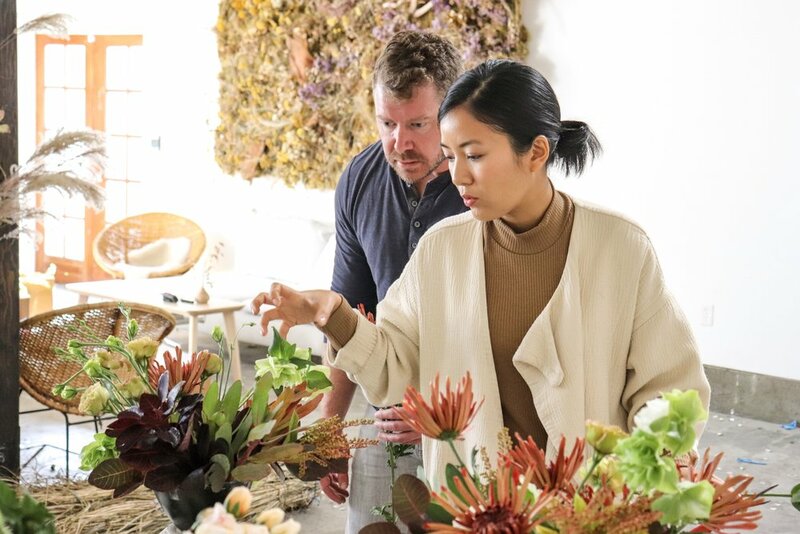 We were lucky enough to be able to meet with Amanda at the San Francisco Flower Market to get a behind the scenes look at her design process from start to finish. We began our process by running around the flower market collecting different flowers based on size, texture and color. We chose a more rustic arrangements with elements or deep purple and green. Amanda was clearly a regular at the mart, with many of the workers eagerly greeting her upon arrival. After we collected our ingredients, we took them back to Studio Mondine and started the creative process of composing our arrangements. We used chicken wire to create the space to insert the flowers in our vases. “For this arrangement we had roses as our medium, marigold, and our hero, the mum flower. Pretty much every composition we pull feels something like this,” Amanda stated before starting her composition. Think fireplaces, built-in bathtub surrounds, and grand staircases. These are the places we are looking at to make some of the boldest statements in interior design right now. I think it’s time to rebel against safe design, but I’ve always said timeless design is pointless if it’s boring and unremarkable. We are really loving new designs in marble and especially quartzite in vivid colors and designs. Bold purple veined sinks, stairways that have book-matched stone, and showers designed with stone creating chevron designs. Remember just because a design decision is bold doesn’t mean it’s crazy. Design spaces that you love with carefully considered design never goes out of style.